Thomas Keller is the owner and head chef several restaurants in California, Nevada, and New York, his most famous being The French Laundry – a small place in Yountville, California that has a three-star Michelin rating, and that some call the finest restaurant in America. 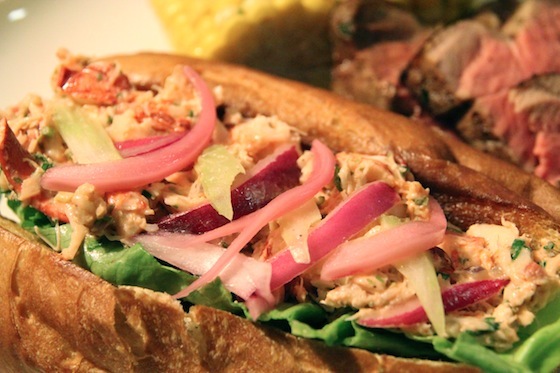 He has won multiple James Beard Awards including “Best Chef in America” in 1997. Though his most famous restaurant is noted as the epitome of gourmet cuisine, Chef Keller is simply in love with food, whether it be French Laundry style, or “homestyle”. In 2005, he opened a restaurant near The French Laundry called “Ad Hoc” that focused on more simple, family-style, comfort food meals. 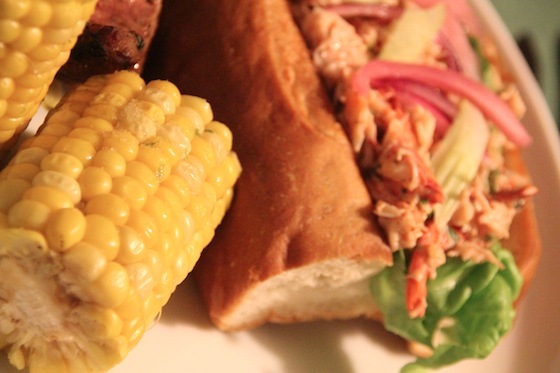 Ad Hoc was was supposed to be a temporary offering in the space while he planned his dream restaurant – one that serves hamburgers and wine – but due to its popularity, it was decided that Ad Hoc should be made a permanent fixture. 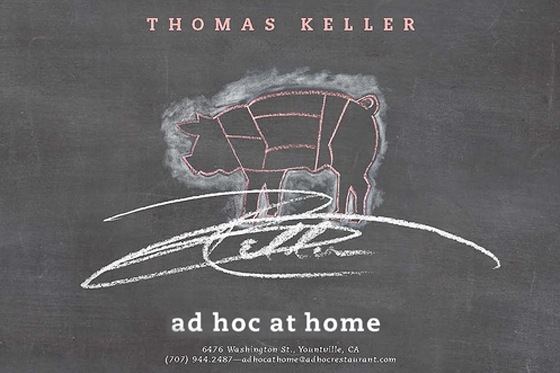 Chef Keller also released a book called “Ad Hoc at Home” and included over 200 recipes from dishes served at the restaurant, as well as ones inspired by the meals he grew up on. These recipes were also meant to be more accessible to the home cook who may not have the time or the skills yet to recreate some of the other, more elaborate dishes featured in Chef Keller’s previous cookbook offerings. and some absolutely fabulous corn on the cob with freshly homemade lime salt. This meal was one of the best Nick has made, and one of the best that I’ve been lucky enough to enjoy. The lobster salad was light and fresh, with the lobster being the star instead of the dressing being an overpowering blanket of mayo, and the crisp butter lettuce, celery slivers, and pickled onion gave a wonderful crispness and extra kick of flavor. 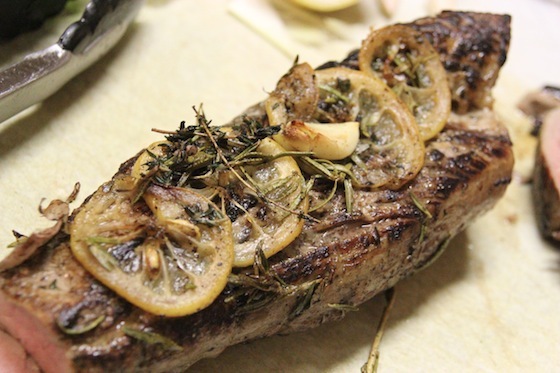 The tenderloin was juicy and delicious – Chef Keller does not have the cook roast the pork loin to a dry, chewy oblivion, and the brine also helps to keep the meat moist while adding some lovely flavor. 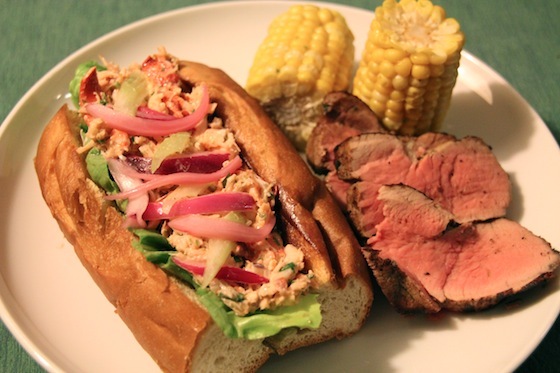 The best lobster roll and the best pork tenderloin I’ve had to date; but I do have to say that the thing that brought the whole dinner together for me was the corn on the cob. It was sweet and salty with a nice bite of lime – refreshing, starchy, savory, tart – just absolutely fabulous. I not only finished what was on my plate – I also ate another helping of just the corn for dessert. If you enjoy comfort foods but think you might want to explore new ones, or slightly new ways of preparing them, I cannot recommend this book enough. There are helpful tips and technique hints in the book, as well as gorgeous photos of the food, cute drawings and even pictures of Chef Keller himself, kind of like your culinary coach through this journey of deliciousness.